Biba has become a potent legend quite out of proportion with its relatively brief life in the mid-twentieth century. It was a shop and a label-but it was more than either or both of these: it came to stand for the "swinging chick," the ideal, running, jumping and never-standing-still girl, the image that dominated fashion from the mid-1960s until about 1974. That one word, "Biba" calls up from memory the long-legged, zany, crop-haired Twiggy morphing into the druggy, Pre-Raphaelite hippie of 1970: from the futuristic to the retro in four short years. Biba was the creation of Barbara Hulanicki and her husband, Stephen Fitz-Simon. It began as a mail-order firm, selling gamine gingham shifts with matching head scarf in the wake of Brigitte Bardot. In 1964 the couple followed the just emerging trend for the fashion boutique as opposed to the department store where most women bought their clothes in the 1950s. (Small dress shops, known in Britain as "madam shops," still existed, but were by this time considered very old-fashioned, and small dressmakers were also dying out.) Biba's first outlet opened in the smart Kensington district of London. The young couple rented what had been a chemist's shop, retained in the window the big period bottles of ruby-and topaz-colored liquids that traditionally decorated such shops at that time (suggestive of magical potions), and created a dark blue interior with William Morris curtains, more like an Aladdin's cave than an ordinary shop. This was a totally different shopping experience from the department store or the "madam shop." There were no assistants pressuring you to buy by peering into the claustrophobic changing room and commenting on the clothes; instead there was a communal changing room free for all, more reminiscent of the school locker room than of adult life-but in an exciting way. The message was always that these fashions were for the young and carefree. Biba really began to make an impact just as the mood of the 1960s began to change. From 1966 on, a creeping sense of economic discontent and social unrest in Britain was beginning to supersede the optimism of the first half of the decade. One of the ways in which this was expressed stylistically was in the mutation from future to past. By 1967 the Courrèges look-flat white boots and a square-cut tunic, reminiscent of cinematic fashions of the future-was being displaced by much dreamier clothes. The two other most influential British fashion designers of the period, Mary Quant and Ozzie Clark, began to use such "old-fashioned" textiles as crêpe and satin in art deco colors of eau de nil, cream, rust, and even maroon. 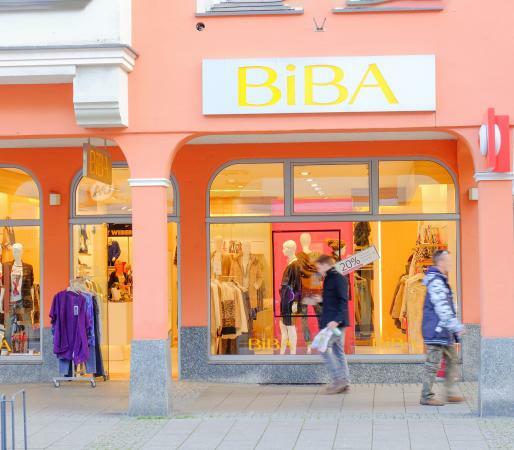 Biba was at the epicenter of this trend from the beginning. The shops had a distinctly period feel, with bentwood furniture, vases of ostrich feathers, Tiffany-style lamps, Victorian china pedestal jardinières, and even-in Biba's third shop- the Victorian gothic paneling from a recently relocated boys' school. The clothes were subtly period, too. Minidresses looked like something out of Mabel Lucie Atwell, childishly high-waisted, with sleeves tight at the shoulder but ballooning out toward the cuff. Trousers flapped out at the hem, like men's "Oxford bags" of the 1920s; slithery satin evening dresses looked like gowns Jean Harlow might have worn in a 1930s' Hollywood melodrama. Then there were T-shirts, exaggeratedly long of hem and sleeve, and knee-high suede boots all in matching offbeat colors of dirty pink, brick dust, sage green, aubergine, and chocolate; and a makeup range that made the wearer look like the silent film star Theda Bara, with black lips and glistening eyes. Biba was a way of life as much as a dress shop, and its greatest moment became its ultimate tragedy. From the original shop, it moved-still in Kensington-first to a grocer's shop, retaining all the period wooden shelving, then to a yet larger shop that had been a school outfitters, and finally to what had been Derry and Toms department store, a fabulous art deco building, complete with roof garden and all the original fittings, carpets, and staircases. On these five floors, Biba aimed to sell not just clothes but a whole lifestyle. As well as the dresses, there were to be aubergine refrigerators, Biba dinner services, art deco carpets, a food department complete with coffee, tea, flour, and sugar in Biba packaging, and-on the ground floor-all manner of trinkets, purses, scarves, accessories and, of course, the makeup range. It was a magnificent vision. Unfortunately the hordes of young women who came to hang out among the satin bolsters on the tiger-print sofas of the ground floor, with its dark walls and druggy ambience, did not necessarily come to buy but simply to be Biba. By this time, Barbara Hulanicki and her husband had lost financial control of the enterprise to the multichain fashion company Dorothy Perkins, and the returns were not high enough to satisfy its board of directors. In 1975 Biba folded-and not only that; in an act of the utmost philistinism, the magnificent original Derry and Toms interiors were destroyed to make way for a utilitarian Marks & Spencer and British Home Stores. Barbara Hulanicki and her husband moved to the United States, and Hulanicki made a second successful career designing interiors for the art deco mansions of Miami, Florida. In 1993, the Laing Art Gallery in Newcastle decided to hold a Biba exhibition. Many Biba aficionados previously donated the outfits they had treasured for thirty years. There were examples of the coffee-and even baked bean-tins, the cosmetics, and the soft furnishings, and the interiors of the shops were re-created. But what was extraordinary about the exhibition was the visitors' book. Visitors were invited to comment in any way they wished. Unlike other visitors' books, its pages were filled with loving reminiscences of how a Biba outfit had defined a major experience, a period, an identity, and although Biba the shop spanned only a decade, the memory gave promise of living on forever. See also Boutique; Ossie Clark; Mary Quant; Twiggy. Fogg, Marnie. Boutique: A '60s Cultural Icon. London: Phaidon Press Ltd., 2003. Hulanicki, Barbara. From A to Biba. London: Hutchinson, 1983.